우리나라 최초의 사립미술관인 토탈미술관은 문화에 대한 제도적 기반이 전무하다시피 했던 1976년 동숭동 대학로에서 디자이너를 위한 토탈갤러리로 시작하여 1984년 경기도 장흥에 국내최초의 야외조각공원 형태의 미술관을 설립하였다. 당시 미술관 개념이 정립되지 않았던 시기였기 때문에 등록 절차에 많은 어려움이 있었으나 서울올림픽을 앞두고 1987년 문교부(현 문화체육관광부)가 처음으로 미술관 등록을 허가하였다. 이후 2002년까지 수많은 애호가들의 사랑을 받는 명소가 되었다. 미술관 개념의 확대와 더불어 1992년 서울 종로구 평창동에 현대예술 전반을 통섭하는 전시장을 마련하였다. 평창동 전시공간은 국내외 현대미술 전시 뿐 아니라, 음악회와 각종 이벤트, 교츅프로그램, 출판, 강연, 워크숍, 세미나 등 다양한 장르의 문화를 폭넓게 수용하는 복합문화공간으로 자리매김하였다. 토탈미술관은 많은 관람객들에게 건전한 삶의 에너지를 충전하고 향유하는 풍요로움을 선물하고자 하며, 작가들에게는 무한한 실험정신과 창의적인 활력을 이끌어내는 문화생산자로서의 역할을 지향함으로써 예술전반에 대한 폭넓고 깊은 소통의 장을 꿈꾼다. 토탈미술관은 비탈길의 경사를 등지고서 전면을 향해 활짝 열린 건물과 데크 공간을 가지고 있는 것이 특징으로 하며, 꽃들이 활짝 핀 마당의 봄에서부터 하얀 눈꽃이 나무마다 맺히는 겨울까지 계절을 가득 담고 있다. 마당에 덩그러니 놓인 베르나르 브네의 작품은 세월과 문화를 자연스럽게 녹아내는 미술관의 특징을 그대로 보여준다고 할 수 있다. 1층 아카이브 공간을 지나 지하로 내려가면 돌출된 바위벽을 그대로 가진 전시실과 밖을 향해 유리창이 전면으로 트인 전시실이 있다. 한층 더 아래로 내려가면 압도적으로 높은 층고의 전시공간을 만나게 된다. 이처럼 전시장 또한 내/외부를 넘나드는 복합적이고 열린 공간으로서 예술적 에너지를 가득 담고 있으며, 미술관 공간 구성 자체가 현대미술의 다이나믹함을 그대로 반영하고 있다. 토탈미술관의 이러한 특징적인 건물은 토탈미술관의 설립자이기도 한 문신규 건축가가 설계하였으며, 한국건축가협회에서 수여하는 ‘올해의 건축상’을 수상하기도 하였다. 1993년부터 시작한 토탈아카데미는 일반인을 대상으로 한다. 미술은 물론 음악, 건축, 영화, 공연, 예술철학, 문학 등 다양한 예술장를 넘나들며, 각 분야의 전문 강사를 초빙하여 1년 과정으로 운영되고 있다. 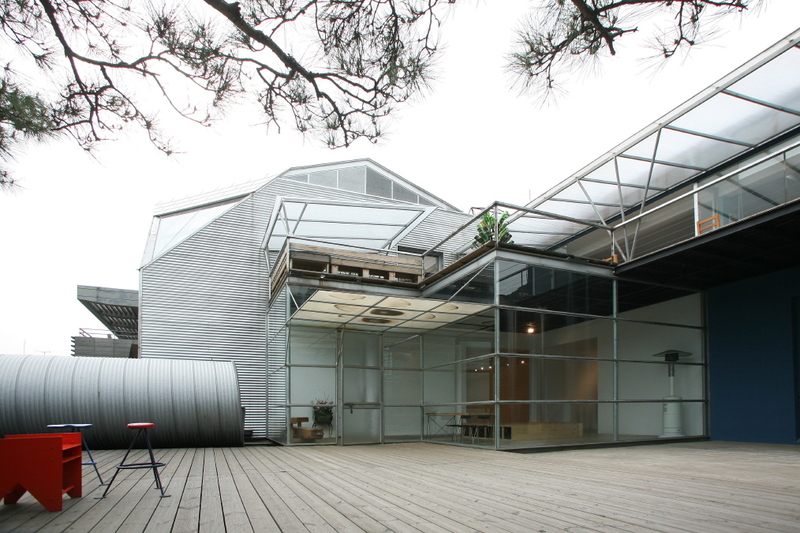 TMCA, Korea’s first privately-owned, contemporary art institution was founded by architect Shin-Kyu Moon and director Joon-Eui Noh in 1984. In 1976, prior to founding the museum, the couple established the Total Gallery, devoted exclusively to craft and design, in Daehakno, Seoul. In 1984, they opened the nation’s first sculpture park, the Total Museum in Jangheung, Gyeonggi Province. The park served as a prominent destination for many art seekers and the public until its closing in 2002. 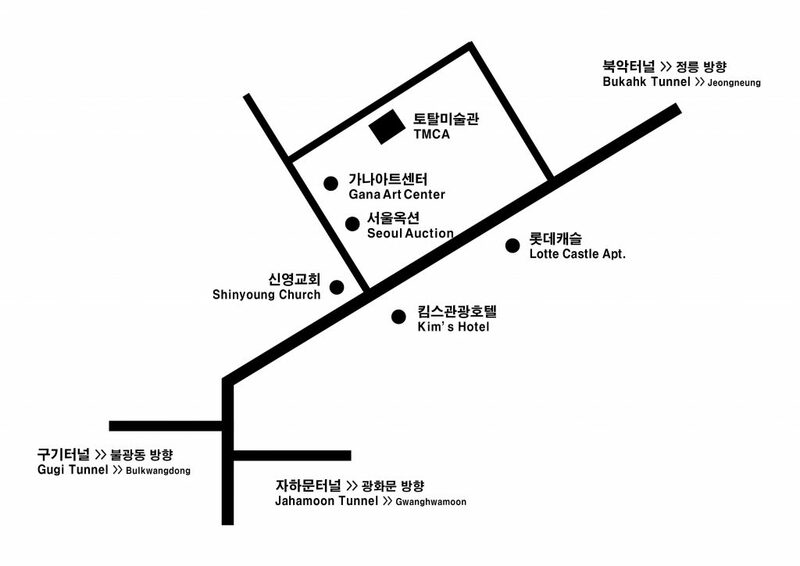 In 1992, the museum opened the doors to its home in Pyeongchang-dong, Seoul with a new name, Total Museum of Contemporary Art (TMCA). Since then, it has become a pioneer in establishing the world-renowned art district, New Pyeongchang, with numerous art museums and galleries. The TMCA building was designed by founding architect Shin- Kyu Moon. In 1993, the museum won the ‘Architecture Award of the Year’ rewarded by the Korean Institute of Architects. Moon intended the whole building to become a “blank canvas” for contemporary artists. The concept of having exhibition halls with distinct personalities truly reflects the architect’s philosophy of an art museum. The museum proudly offers its arts & culture learning program, Total Academy. Established in 1993, the Total Academy was designed to create opportunities to advance the cultural literacy in visual, literary, and performing arts- art, architecture, philosophy of art, literature, music, film, and theatre. It is open to both professionals and non-professionals. Benefit: Free admission for members and accompanying 1, free invitation to the Museum Concert, free to Art Catalogue.